I love raw feeding too. I also like blue buffalo because they use hormone and antibiotic free meats. My dogs eat diets very similar to what you feed!! Part Kibble, part raw, and part other stuff! Jake’s diet grew out of the exclusion diet our vet suggested when commercial / processed food gave him severe gastric problems. He now eats raw meat, about 50% of which is pork ribs; some cooked rice or potatoes, and sometimes cooked green veg. And any scraps we know won’t disagree with him. He’s thriving. 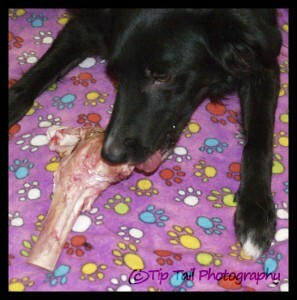 Raw bones are fine as long as they are big bones for the dog. I have a bischon and chicken necks are fine. Never give cooked bones as they are brittle and become dangerous. My dog has fresh meat (wagyu) and quality dry food. Your dogs are very lucky that you take such great care in their feeding. It is so important to their health and happiness. Very nice article and will help others decide on a feeding habit. Maddie gets straight kibble – Nature’s Logic . it is the only food that seems to really work for her. She did not do well on a raw diet. Ace is on kibble, but I’m thinking about switching him over to a raw diet. I’m concerned about cost, mostly, and him getting major runs. But when I do it I will do one meal raw food and one meal kibble and see how that goes. Ours get dried food as well as Raw Bones, Raw Meat, fresh eggs from our Chickens, cooked potatoe peel (which they love) and chicken wings now and then. Without doubt they love munching on Raw Meaty Bones the best. It also keeps them quiet for hours and keeps their teeth sparkling. I feel the same about the chicken bones. My dogs only get the big beef bones like you have pictured here. My dogs used to get a home made all natural raw food diet but now that I am working full time I can’t keep up. We switched to a natural kibble from Merrick. My dogs love the Turducken which comes with veggies. Previous Previous post: Charlie is a Border Collie!